From May 20 through 25, 2018, nearly 500 Berkeley College volunteers painted benches and beautified parks, served lunch to those in need at shelters and food kitchens, and connected with youth, seniors, and the homebound. In Rockland and Westchester counties the volunteers assembled “blessing bags” of toiletries for the homeless at the Open Arms Men’s Shelter and Samaritan House Women’s Shelter in White Plains; stocked pantry shelves at People to People, Inc. in Nanuet; packed food for Feeding Westchester clients in Elmsford; and shared a breakfast and planted flowers at Gilda’s Club in White Plains. 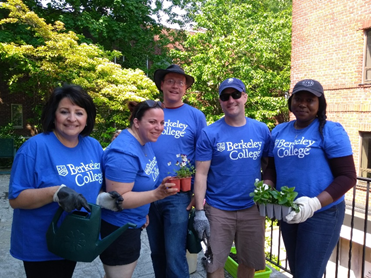 “Through Community Service Week, faculty, staff, alumni and students share their time and talents with local organizations, serving as ambassadors of Berkeley College’s longtime commitment to social responsibility,” said Michael J. Smith, President of Berkeley College. Photo Captions: Top: During Berkeley College’s Community Service Week, May 20 through 25, 2018, volunteers work to support Feeding Westchester in Elmsford, NY, by packing foods selected for distribution to hunger relief agencies in Westchester County. Bottom: After sharing a breakfast with members, Berkeley College volunteers at Gilda’s Club in White Plains, NY, plant flowers in containers to beautify the facility.